The way Revit handles revisions works very well. 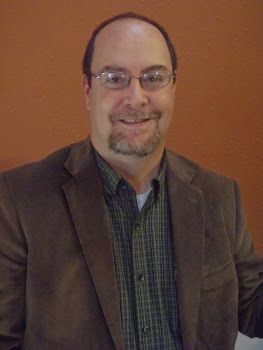 I will walk you through the simple steps in managing revisions for a project. 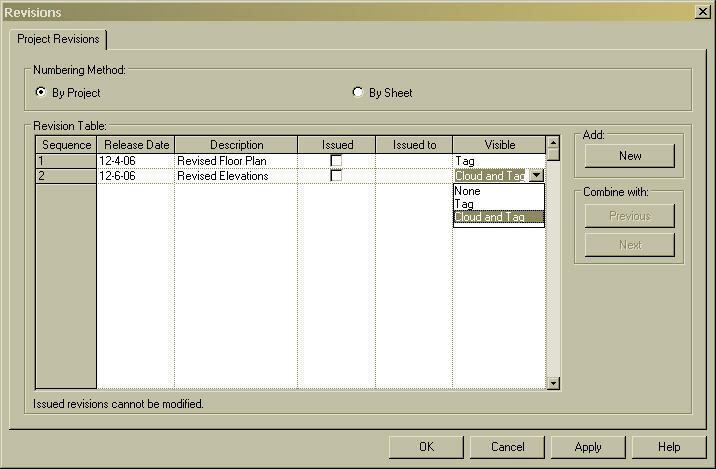 The first step is to open the Revision Setting dialog box. 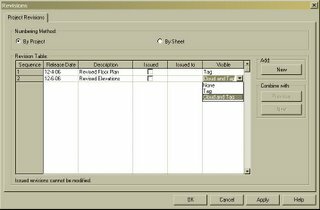 Expand the Settings pulldown and select Revision to open the dialog box. The first settings will control whether your revision numbers are By Project or By Sheet. This will depend on your company standards. By project will tag your revision with the delta symbol of the next available number. By sheet will tag your revision with the delta symbol of the next number of that particular sheet. You should set this at the beginning and leave it as your default. The Revision Table begins with one revision as the default. You can edit the Release Date, Description, check the Issue box, or fill in who the revision was Issued To for any revision. You can add new revisions by clicking on the NEW button. Once you have a revision issued, you may want to change the visibility so the contractor will not get confused by looking at old revision clouds. 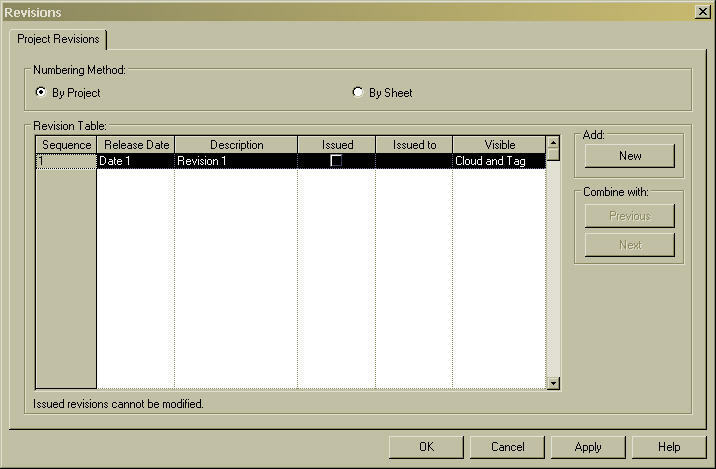 You can choose to show either "Cloud and Tag", "Tag", or "None" under the Visible column. The actual Revision command can be found on the Drafting menu bar. 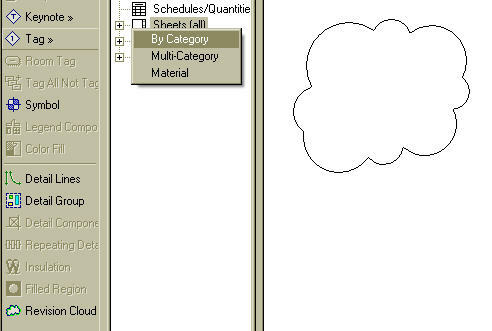 This command is only available in a Sheet View. Once the command is started, you will enter into a sketch mode. Simply draw the cloud around the area that was revised and click Finish Sketch. You can then tag the cloud by starting the Tag command and picking By Category. If the Revision Tag is not loaded into your current project, it can be found under the Annotation folder in your family directory. As soon as you place a cloud onto a sheet, the Revision Schedule in the title block will be updated to include the revision number, description, and date. The revision schedule is included on the default template title block. There is a known bug with release 9.1 that will not allow you to add a revision schedule to a custom title block. Hopefully this will be fixed soon, but for now, you can create your title block by editing the title block on the default template. 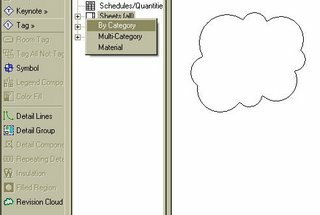 Keeping track of your revisions are simple in Revit. It manages all your revision numbers and dates. Of course, hopefully you will not need to know how to use this due to the fact that you never actually have to issue any revisions... right?!? The system might work but when you change the model where do you capture the revision. I would cloud the revision everywhere it showed up on the sheets. You have a valid point. I wish there were a way for Revit to track the modifications throughout the entire model, but it is still up to you to know what changed and where it shows up on the sheets. Thats why I typically have one person in charge of the documents to act as a control point. If you get the latest build the titleblock issue is resolve. Daniel is correct above. The latest build does correct the problem. The Autodesk Revit Building 9.1 - 20060928_2300 build was relesed in October. (Prior to this build release in relese 9.1, when you tried to start a new title block by slecting "File", "New", "Titleblock", the Revision Schedule under the View pulldown menu was grayed out. You could not insert one.) Thank you Daniel for pointing this out. Do you have any experience of trying to get Revit 9.1 to run on a Vista 32bit operating system? is there a way to show just the date and the submittal description?